Many patients do not know what to expect from a Rhinoplasty consultation. The truth is that a Rhinoplasty consultation will vary from surgeon to surgeon. So, it is important that patients understand what to look for during their Rhinoplasty consultation to help them identify the best possible surgeon for their procedure. At Facial Plastic Surgery Associates, you can expect to spend 1.5 to 2 hours for your consultation with Dr. Russell Kridel. As Dr. Kridel says, "no two noses are alike," so it is important to do an in-depth consultation, including a very thorough examination to provide patients with a treatment plan that is designed specifically for them to achieve their desired result. 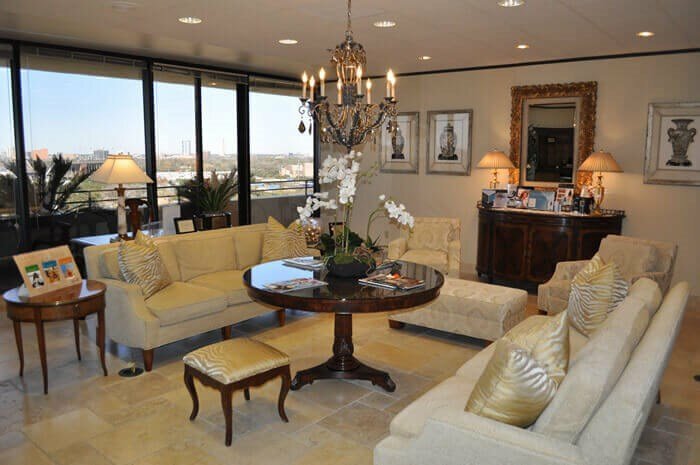 When you arrive at our beautiful offices in the Texas Medical Center, one of our fabulous staff members will take pictures of your nose from multiple angles. Dr. Kridel and his team will then use computer software to image your photos to show you what you can expect your nose to look like after Rhinoplasty surgery. Next, you will meet with our patient coordinator to review the extensive before and after photo books, as well as share any questions or concerns you may have about Rhinoplasty surgery. Dr. Kridel will do a thorough examination of your nose and will have a conversation with you about your nose and nasal surgery. You should feel free to ask questions and share any concerns you may have, whether it is about difficulty breathing, the current appearance of your nose or the surgical technique he recommends. Dr. Kridel is very approachable and happy to answer any of your questions about Rhinoplasty. You will also have a Rhinometry test done. Rhinometry is a diagnostic measurement of the nose through acoustic reflections. It evaluates nasal obstruction by analyzing reflections of a sound pulse introduced via the nostrils. The technique is fast, non-invasive and does not require the patient to do anything special. As an objective screening and evaluation test, Rhinometry will further help to identify or confirm that a patient may have a deviated septum, hypertrophied turbinates or other types of upper airway obstruction that may need to be addressed during surgery. At Facial Plastic Surgery Associates, we are one of the few plastic surgery offices in Houston that performs this additional examination. Why? Because Dr. Kridel feels it is imperative that patients not only look great, but they can also breathe well following Rhinoplasty surgery. Many Rhinoplasty surgeons only deal with the aesthetic component. This is one of the key differences when you have a Rhinoplasty consultation with Dr. Kridel. He deals with both the functional and the aesthetic components of your nose. Because he is double board certified by the American Academy of Otolaryngology-Head & Neck Surgery and the American Academy of Facial Plastic and Reconstructive surgery, he has significant depth of training and experience in the anatomy of the nose, face and neck, as well as plastic surgery techniques. In fact, Dr. Kridel has been awarded the top honors for surgical excellence by his peers and has published over 60 scientific journal articles just on Rhinoplasty. Following your Rhinometry test, Dr. Kridel will discuss the test results and review your imaged photos. You will be able to see and discuss with him what you can expect your nose to look like following Rhinoplasty surgery. Dr. Kridel takes these photos into surgery with him as well. Our nurse will also discuss with you pre-operative and post-operative instructions and you will watch a video about nasal surgery. Our patient coordinator will review the recommended treatment plans and estimated costs for surgery as well. So, as you can see, not every Rhinoplasty consultation is created equal. Dr. Kridel is extremely thorough and is highly regarded throughout Houston and internationally as a Rhinoplasty expert. It is also why he is often referred to as THE Nose Doctor or The Doctor’s Doctor. Click here to view some before and after Rhinoplasty photos.